With the clocks going back this weekend, we got an extra hours sleep; I was exhausted after day exploring Malaga on my recent press trip so Saturday night was perfect timing for me; an extra hour in my big fluffy bed at The AC Hotel Malaga Palacio and I could actually see out of my window before I left for work this morning. Even at the weekends, if I sleep in past 8.30 I feel like I’ve already wasted a big chunk of my day; so waking up at the same time all week actually works pretty well for me! On a work day particularly though, it means I know exactly how many minutes I have until I need until I need to do the next thing. On a weekend, as you know, its usually avocado toast but I don’t always have time to eat breakfast before I leave for work. I find it very hard to work with an empty stomach so I will always fit it in somewhere. During the week I always try to have a piece of fruit and some kind of cereal when I get to my desk! If I really cant wait though, I'll pick up a chocolate chip belvita soft bake (or the crunchy hazelnut one) on the train. They're easy to eat on the tube and the five wholegrains in them slowly release carbohydrates over four hours - it's really important for me to have a breakfast that can supply me with steady energy through the morning otherwise I spend hours digging through my snack drawer, usually finishing up with me eating a whole bag of chocolate raisins. 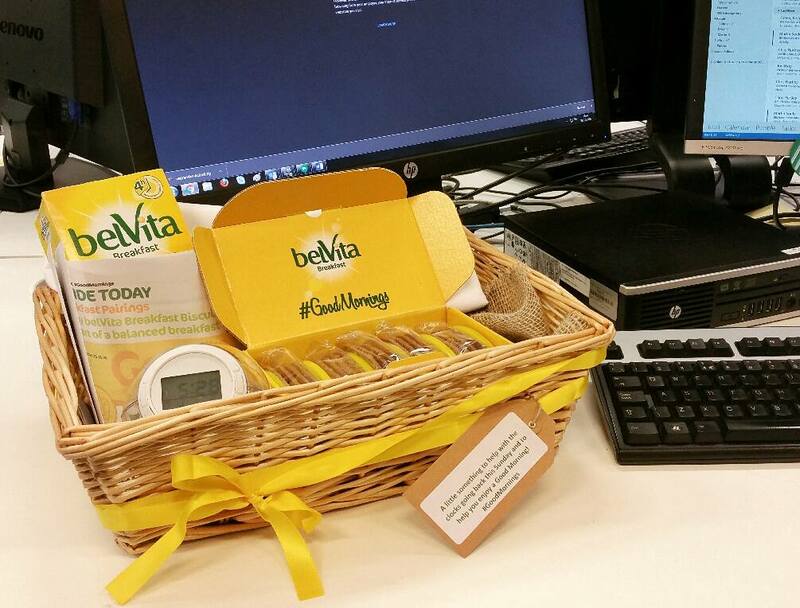 Knowing that I am a big fan, Belvita sent me a cute care package to work - so thats breakfast sorted for the next week. I'm going to take a couple of packs home for the weekend as well. I saw as part of their #GoodMornings campaign that they also work well made up with yogurt and fruit so I definitely want to try that when I have time! These days, the house is very quiet in the mornings and it’s just not something I am used to. Growing up, my brothers were slow so everyone would be shouting at each other to put shoes on or brush teeth but now that they have to sort themselves out in the morning, it’s a lot quieter. I like a bit of noise so I listen to Capital every morning. Apart from upbeat music, I actually just enjoy listening to them talk, it seems to make my mind focus a bit more. When the alarm goes off for work in the morning, I need light otherwise I fall back to sleep just as quickly as I woke up. If it’s a dark wintery morning, I switch on my bedside lamp but in the summer, I tend to sleep with the blinds half open so that the natural light from the sun can fill my room in the morning and gently wake me up; it always puts me in a good mood for the day. I’m a bit of an early bird and recently, I have really noticed how much difference an early night makes to how I feel in the morning; any later than midnight and I struggle. I also try to prepare some of my clothes the night before, waking up and not having to think about what you are going to wear for the day makes mornings so much less stressful, you wouldn't believe it! This video from Safestore suggests doing it for the whole week ahead which, come to think of it, would mean a little extra time in bed, every single day! What makes your mornings easier? 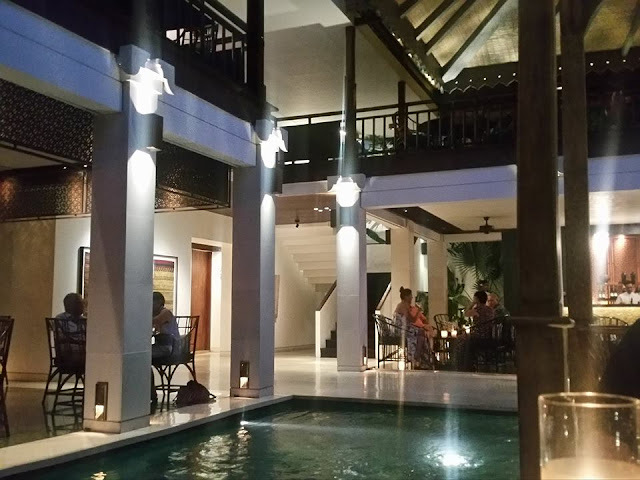 During our time in Seminyak, we spent five nights at The Elysian resort & like our villa in Ubud, it had a private pool and a pretty incredible bath situation. While they were both just as amazing as each other, our villa in Seminyak had a much more modern and luxurious feel to it. We only had one full pool day and the first thing we did was open the big front room windows which covered two whole walls. We loved that our whole garden was in the sun during the day but turning the living room into part of the garden meant we were able to lay in our air conditioned lounge when it got too much. The resort also supplied an Ipod dock so we hooked that up with my nano that I haven’t updated since 2009. The first song that came on with from the Lizzie McGuire movie which had us giggling; Andrew actually loves that song. After reading a few trip advisor reviews, I knew exactly what I wanted to do with my one pool day at The Elysian. They offer private in-villa BBQs and at £35 we booked up for lunch! Everyone seemed very confused as to why we didn’t want to book for dinner, I supposed it’s more romantic but we didn’t want to stay in the villa all night so decided to book ours for 2pm so there was lots of pool time and sunbathing before and after. Right on time, a whole team of people turned up at our villa and all got to work at once, it was a bit of a whirlwind five minutes actually as we were just expecting a some food and a DIY BBQ to arrived. Two men brought in a big gas grill and got to work setting that up, our sunbed was moved out of the way and replaced with a table and chairs, complete with tablecloth and flower, someone else brought the food (we went for seafood option), another person came as swept the garden and one more cleared any leaves that were floating in the pool; they all did their jobs and then disappeared, leaving Andrew and I with a chef and waiter. After waving them all off; (everyone was so friendly) amazed, we both sat down in our swimwear whilst the chef got to work putting everything on the BBQ and drenching it all in melted butter. Our waiter first brought all the sides up to the table; garlic bread, potato salad, avocado and a bowl of steamed rice, it wouldn’t be Asia without the rice! I thought it might be a little bit awkward having them there but they made us feel comfortable and we really enjoyed chatting to them. Once salad was served, the first round of fish was ready! There was so much food. 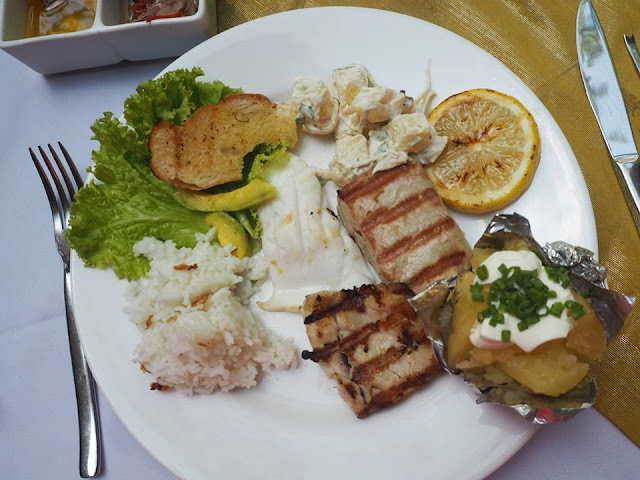 We started with tuna steaks, Mahi Mahi, jacket potatoes and grilled squid followed by king prawns and half a lobster each and every piece was delicious. Once all the food was cooked, they asked if we wanted anything else and then left us to enjoy the afternoon together telling us to call them when we were ready for someone to come and clear up. They even had dessert delivered half an hour later but I was honestly too full by then! We spent the rest of the afternoon the same way we had spent the morning, playing around in and out of the pool and relaxing in the sunshine (and in the shade). It was all very honeymoony but such a wonderful day! I’m really not sure why but we only booked one full day in Ubud but I fell in love with the place as soon as we arrived so I needed to be sure to pack as much into our one day there as possible. With a little bit of research and some good planning we managed it just fine. I highly recommend finding a taxi driver that you like and booking in a day tour with them. We were lucky to have an evening to find someone but there are taxi drivers sitting on the streets so you should be able to find someone and go straight from there. Our driver was friendly, knowledgeable and spoke good English so we agreed a price (400,000, about £25) and arranged for him to pick us up from our hotel the next morning. Top Tip: Don't be scared to barter with them; we very easily got to that price from the 700,000 he asked for originally. He drove us wherever we wanted and each time, he parked up and came along with us as a tour guide would. We were able to spend as much time in each place as we wanted and we also learnt a lot from him, chatting about Balinese culture, his knowledge of the temples and religious beliefs and hearing about his family and their life here. He also turned out to be a pretty good photographer! The forest is home to hundreds of Balinese long tail monkeys and they are able to run around freely and do exactly what they want; that's what makes it such an amazing experience. It's a pound or two entrance fee and whilst they get fed by the staff, if you are brave, you can buy your own bananas to feed the monkeys although beware and try to avoid eye contact with them. Also keep an eye on things like glasses and cameras, as they often grab anything they can get their hands on. Our driver told us there are different monkey 'gangs' and they can be very territorial with each other so we saw a lot of fighting but we also saw lots of playing, sharing food and looking after one another too. I'm not sure why it's called the art market because we didn't see any art. The market is five minutes from the monkey forest and whilst it's small, it's buzzing with people and full of vibrant colours. We stopped off to buy a sarong as many temples in Bali require you to wear one but stayed to look around after; I love a good market. It's not essential to buy your own sarong as most temples provide them but for just under £5 for two (and those were the expensive, quality ones), they made for a great souvenir as well as being useful! Top Tip: Although its not worth a trip of its own, if you visit the market, you may as well pop into the Ubud Royal Palace as it is located just across the road. This one is a little further out and about half an hour in a car from the monkey forest but it was definitely worth it as this temple was our favourite stop of the day. Tirta Empul means ‘holy spring water’ and people flock here for its purification baths as they believe that the holy water is able to cleanse the mind as well as the body. This is where the sarongs got their first use as you are forbidden to enter without one. The main attraction inside is the large pool with 13 spouts of water flowing into it. People queue to get a chance to pray under the springs and wash away their problems. It's mainly local people who seek purification at the springs although tourists sometimes get involved too. 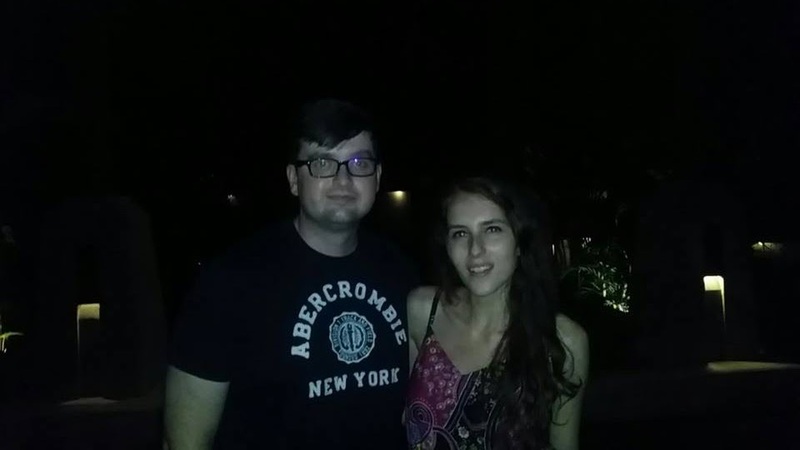 Obviously the place has a certain vibe to it and although we didnt get in the pools, we both still left feeling very spiritual. Top Tip: Think about bringing spare clothing if you want to get wet. 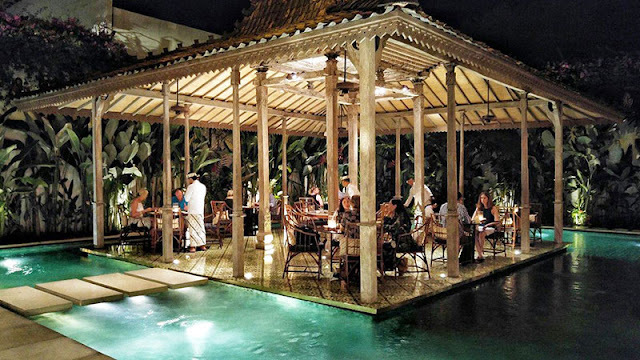 When I researched Ubud, this restaurant came up over and over again. Mozaic is Ubud's awnser to fine dining and a pretty amazing foodie experience. There are four menus to choose from: a six course, an eight course, a surprise or vegetarian. We opted for the 8 course grand menu which cost 1,000,000 IDR (about £60 each) and also included canapés, amuse boushe and petition fours to finish. Think a gastronomic feast outside with tea lights lining the path to your table, lights hanging down from the trees and looking up to the treetops and starry sky above. Top Tip - Book in advance and book it early, we were there for over three hours. Food is a big thing for me, like a real big thing. Trying out new restaurants can become the highlight of my week so obviously it is always a huge part of my travel experience as well. Whenever I visit anywhere, I always do my food research before and continue it whilst I am there. Google is all well and good for full on reviews but Instagram is my number one this sort of thing. I love that you can see exactly what food looks like and what people think of it. I also like to see what photos people post of the actual place, who they are there with and what the vibe is and I get that best through instagram. 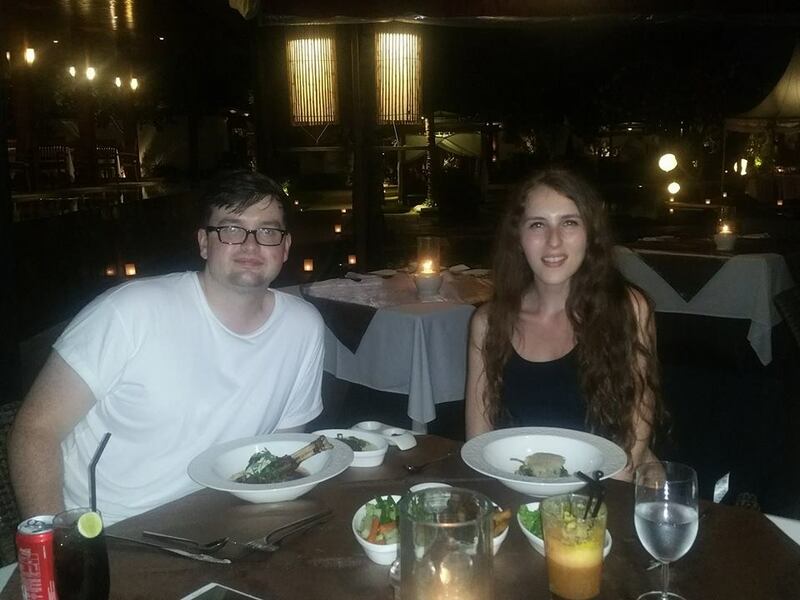 We were in Seminyak for five days and of course we ate out a lot. There were so many unique places out there, and as well as some amazing food we had, there were also some pretty incredible locations. Here are a few that stood out for me. I had been following Cafe Organic on instagram for months and fell in love with their colourful and carefree feed. They opened last year and are all about the super foods but whilst what they serve is healthy, it also looks amazing. Five minutes after leaving our resort in a cab, we arrived in instagram heaven. Before we even saw any food; with white wall and a glass store front, inside was full of bright, natural light. The specials were written in coloured chalk on chalk boards, the table tops were white marble and there were cactus scattered around everywhere. Andrew doesn't do fruit or vegetables so he went for eggs on toast. I ordered a juice and The Acai Coco smoothie bowl which was full of all sorts of berries, passion fruit, mango, oats, granola, coconut, cacao nibs and bee pollen and served in a coconut, obviously. The only issue here was that the service was pretty slow but honestly, that didn't bother us. It was bright, comfortable and air conditioned so we didn't mind sitting there for a bit longer than we would have liked. The total came to around about £7.50 and for me, it was the perfect healthy afternoon snack. The food was very refreshing in the bali heat and whilst I love a smoothie, eating fruit isn't usually as fun as eating chocolate but here it was; they made it fun. The food looks good and more importantly it tastes good. From 4-6, Monday to Thursday, The Woo Bar at the W does two for one signature cocktails plus you get a complimentary pizza so obvs we popped along one afternoon. We spotted two big comfy chairs which was a bit of luck because the place was packed and buzzing with people so we grabbed them and settled down there for a few hours. I ordered a pretty Peach Strawberry Mojito and Andrew had a Strawberry & Champagne Martini which both looked great when they arrived at our table. They had a little more alcohol in them than I would have liked but that didn't bother Andrew and I loved how fruity mine was; I sat there eating it with a fork when I'd finished my drink. Whilst they were quite expensive for Bali at around £7 each, living in London meant that for us, it was rather cheap. Along with our cocktails we got our complimentary cheese pizza, a duo portions of truffle fries and I ordered chocolate milkshake afterwards as well. It was poolside pizza and chips but it was good! The fries were my favourite. Moving on to the reason that we actually went there in the first place - the sunset! We had heard that The W hotel is the place to be and by 6 o'clock, we agreed. Sunset anywhere along that beach would have been pretty but the palm trees, lanterns and the famous W around the hotel made for an extra special silhouette. Whilst I'd been following Cafe Organic for a long time, I only spotted this little gem on Instagram once we were out there, then when we were out, we spotted it very close to where we were staying so we went back for lunch the next day. Obviously, the next day there was a queue outside but we were happy to wait because everyone online seemed to be raving about it plus we were pretty sure that we were going it love it after reading through the menu. I think you'd agree #BrunchGoals. According to their Facebook, it is supposed 'represents the iconic café culture of Australia' but for us Brits, it had a very Shoreditch vibe so we felt right at home too. There was all sorts of delicious brunch style things on the menu from banana brioche french toast to berries & bavarian cream but after eight days away, I was craving a portion of my beloved avocado toast which I ordered on gluten free bread. I love how easy it is to get gluten and dairy free in Bali, its so readily available. My smashed avocado arrived with semi-dried cherry tomatoes, popped capers and feta and seriously, it was so good. I wish we had found out about this place a little sooner into our trip as we would both have definitely have come back and ordered the same thing all over again. With brunch, I had a mango madness smoothie, made with their house made nut milk. Whilst I was happy, Andrew also loved this place because it has a good selection of meat dishes as well. He went for the dirty burger and thanks to instagram, I knew he was in for a bit of a treat but I just couldn't pass up the avocado opportunity although admittedly when it arrived I was a little bit jealous. So these next two definitely deserve a mention but it was was totally dark by the time we got to both of them so you're going to have to bear with me when it comes to photos. Breeze was a very last minute decision for us, we had spotted it on Google before we left and at the time, decided not to book because the menu was very western and to be honest, I thought it was going to be a bit gimmicky, playing on being at the sea front and not actually being very good. We were on our way back from Tanah Lot Temple and didn't have any dinner plans, it was getting late just decided we'd try Breeze because after a week of eating rice (and loving it might I add), Andrew wanted some western food and we knew we could get it there. When we arrived though, my mind changed instantly. All I'd seen of it before was the beach front but as we walked though the hotel to their pool and dining area, I fell in love with the place. It was dark by this time so sadly no sunset views but instead we had candle lit walk ways, lanterns and fairy lights winding up the trees. We originally wanted to sit right at the sea front, like the photos I'd seen but the waves were really loud and over powering so we moved back to a little candle lit hut. 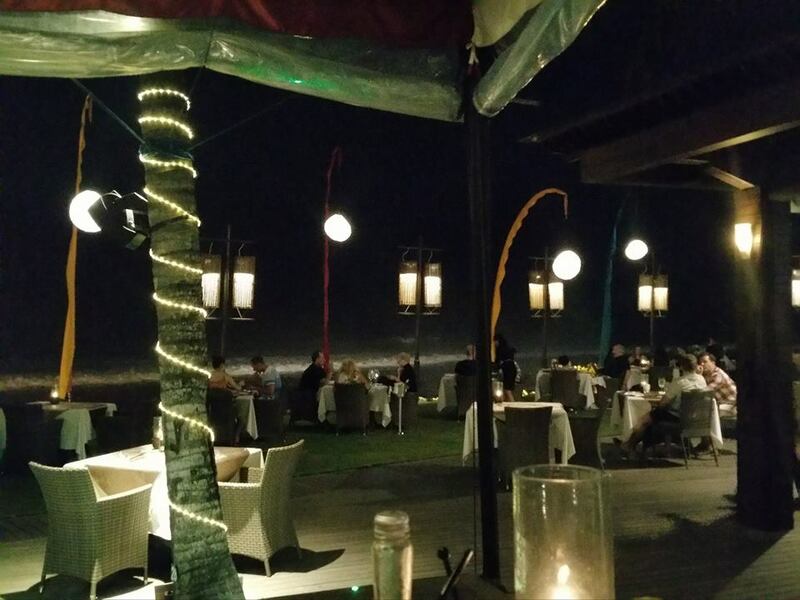 As it was so dark, I didnt get any good photos of where we sat but I found this on Trip Adviser (Thanks Derekneo21) and it shows exactly where we sat. 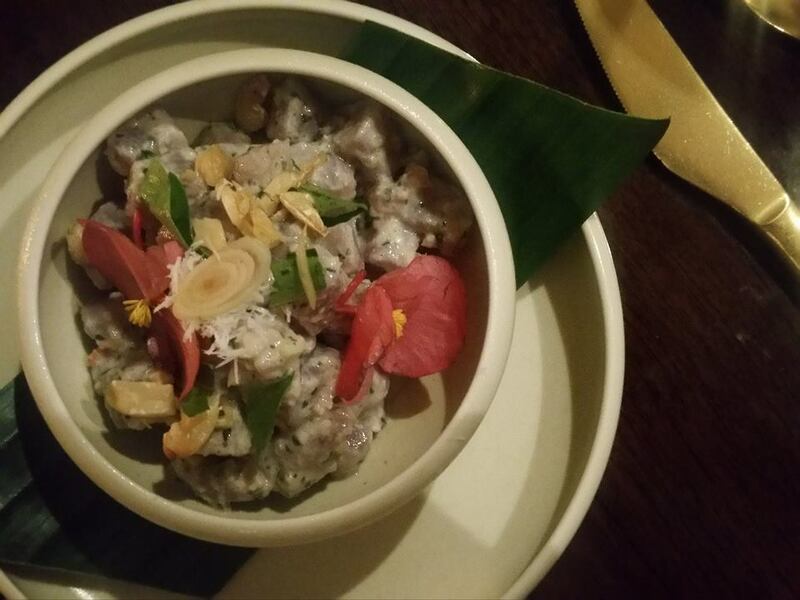 Whilst the setting was super romantic, the food was all delicious as well from the ceviche I had for a starter to the amazing seafood noodle both we had for a main and even the steamed coconut rice we had as a side. We couldnt find the menu for this place anywhere online so maybe they change the food quite often but I would 100% recommend giving it a visit if you're in the area! After a very disappointing trip to our local Thomas Cook, I went home and spoke and to my parents about my travel aspirations for the year. 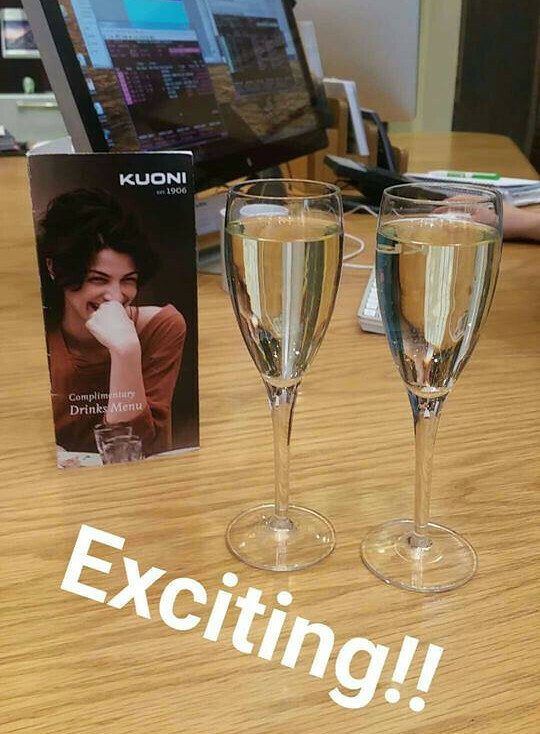 We soon realised that the trip that I wanted to do, was two parts of the three part trip they did for their honeymoon, so my dad’s booking advice was greatly appreciated and he told me straight away to try Kuoni. They made the actual booking of the holiday a whole experience of its own. After my dad mentioned it, we started spotted stores everywhere. The Stratford one, where we booked, had a glass front and high ceilings, it was very spacious and the design had a muted luxury to it. As we sat down, they asked if we would like a drink were totally surprised when they passed us the menu which said that everything was complementary from the coffee to the wine so we ordered two glasses of champagne. We booked with Shaina (who has sadly has left Stratford since) and we would happily to book all of our future holidays with her if we had the chance. She genuinely sounded just as excited as we were about our trip and had great knowledge about our destinations having experienced most of them herself. She was patient and friendly as we looked through countless different prices, changing dates and adding on hotels along the way. We got random emails from her through the months saying ’98 days until Hong Kong’ which was amazing and she even sent us over a list of all her favourite things to do out there. This was in huge contrast to the diabolical service we received in Thomas Cook when the woman decided to call up and get us a price for a 3* hotel that we had not even seen photos of and then loudly huffed and puffed saying she can't keep bothering her team for prices when we weren’t happy to accept the one she’d picked. I always find it a bit daunting going into a travel agents and booking a hotel from their books but Shaina had been to visit most of them with the company so again, she had great knowledge on the vibe of each hotel. Along with that, she gave us loads of time to look through the brochure and use her computer to do some research and look at more photos. Apart from that, I needn’t have worried with Kuoni in the first place as each of their hotels are handpicked and when we arrived at each of the three hotels, we were amazing where we were staying. We had only picked mid-range prices but two out of three of them had private swimming pools! This is something we completely forgot to ask about at the time when we booked. We asked about it, a few weeks later when we realised but they had already included our five different transfers in the price. 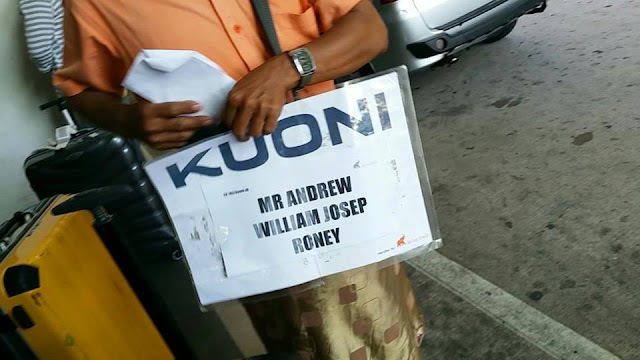 Each time, we were picked up in a private car, and more often than not, with a Kuoni representative, as well as a driver. We found this really useful and spent most of the journeys scribbling down their recommendations in a notebook. As locals, they were all very knowledgeable and we ended up doing most of the things they suggested because they gave us some great ideas. If you’re going for a special occasion, make sure you let them know! It ended up, that they date which worked for us both to go actually included the 16th September, which was our 7 year anniversary. We thought Shaina was just making more conversation and didn’t realise that she took any notice of us but apparently she did. When we arrived in Hong Kong, they offered us a free bottle of Champagne to celebrate and also when we arrived in our last hotel, they brought us a cake! Yum. We had 4 flights on our trip, all economy obviously because we’re not rich. Anyway, we were super pleased that they were able to book our seats when we booked the holiday so I requested an aisle seat for each flight, which I got. Now I don’t know if this is a coincidence but on one of our flights we were the front of economy so we had all of the leg room and for the other three, we were the row behind, so I’m thinking they would have placed us at the front but those seats were already taken so we got the next row. Just something to think about! Both Hong Kong and Bali are amazing places but Kuoni added a whole extra dimension to our holiday with some incredible hotels and just how easy and luxurious they made everything for us. Have you booked with them before?